Golden Gate Ferry is in the beginning stages to automate the ticketing system at all its locations by utilizing self-service ticketing machines able to handle Clipper cards and plans to have it ready for full public use sometime this year. 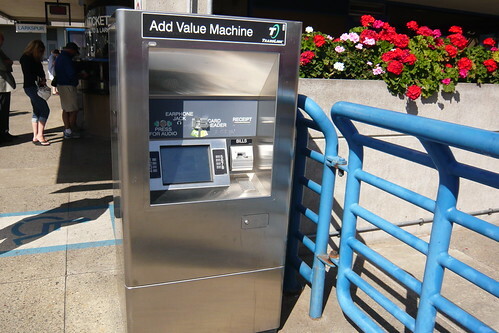 At the SF Ferry Terminal, work has already been done to remove the self-service Clipper add value machines and they plan to install twelve self-service ticketing machines (six at SF, four at Larkspur, and two at Sausalito) in March. They've also installed new Clipper card readers at the Sausalito terminal just beyond the metal security gates. In the end, the four million dollar investment split by "Regional Measure Two" funds us voters approved, and the other half from the Bridge District will be paying for this entire process. They estimate the cost savings at $6.2 million in ten years, and $2.6 million in its first five. Sadly, this would also drop out seven full-time positions at Golden Gate Ferry as they don't need to have people staff the ticketing booth and the sales counter on-board the Sausalito ferry. But while Golden Gate is going through with this process, are they really going to save millions in a matter of just five years? I have my doubts about this. Cash paying adults pay $8.25 regardless of what ferry is taken. Clipper card adults pay $4.85 for the Sausalito ferry (41.2% discount versus cash). Clipper card adults pay $5.70 for the Larkspur ferry (30.9% discount versus cash). As you have noticed, Clipper card customers pay drastically less than their cash paying counterparts and that's because they dropped the commuter ticket books in favor of all passengers with electronic farecards gets the discount automatically. No transit agency in the Bay Area offers a 30% to 41% discount, and not even BART is close with their high value tickets. The people who pay the $8.25 cash fare are typically tourists and people without Clipper cards on a leisurely visit, and most of the time the higher income comes from the weekend cruises. If Golden Gate Ferry follows through and installs these automated machines, I'm betting they may lose money in fare revenue because while the machines can sell full price single and round-trip rides, those machines will also be selling Clipper cards (as per their website: first paragraph, second to last sentence). By offering more ease to get Clipper cards and spreading the publicly known "secret" about the steep discounts, would automation be truly beneficial to the agency? If tourists and occasional riders are smart, they'll buy a new free plastic Clipper card with just enough e-cash value for a round trip on the Sausalito ferry, save $6.80, and dump the plastic card (valued at $2.11) in the trash. Even if Clipper charged a $5 new card issuance fee on top of the ferry fare (as early as June 2011), people will still save $1.80 on their boat fare. Muni might also lose some money too as more people can take advantage of the inter-agency transfer agreement allows Clipper card only passengers exiting Golden Gate Ferry a 50 cent discount on their next Muni ride within one hour. I'm not against the Golden Gate's plans to automate and add more Clipper add value locations (though it would be sad some people may lose their jobs); but if they are going to have automated machines that can spit out new Clipper cards and charge up to 40 percent less than paying the single ride fare, why not just lower the cash only fare to the same fare Clipper card customers pay every single day? It only seems fair. I wonder how many tourists today realized they could get a free Clipper card at the Golden Gate Ferry or Bay Crossings booths, add less than $10, and save a ton of money? Even a tour company realized the massive cost savings and ordered a bulk of Clipper/TransLink cards to give to every single person in their group tours that visits Sausalito every weekend. I don't know how Golden Gate Ferry can offer such deep discounts, but it is totally worth the savings to take a leisurely ride to Sausalito and spend the savings on a nice lunch. Since Golden Gate offered this automatic discount program for nearly a decade (GGT and GGF was one of the first agencies under TransLink/Clipper), I wonder if they actually had an increase in ridership to make-up for the discounted rides, and eliminating the production and distribution of their ticketing books.